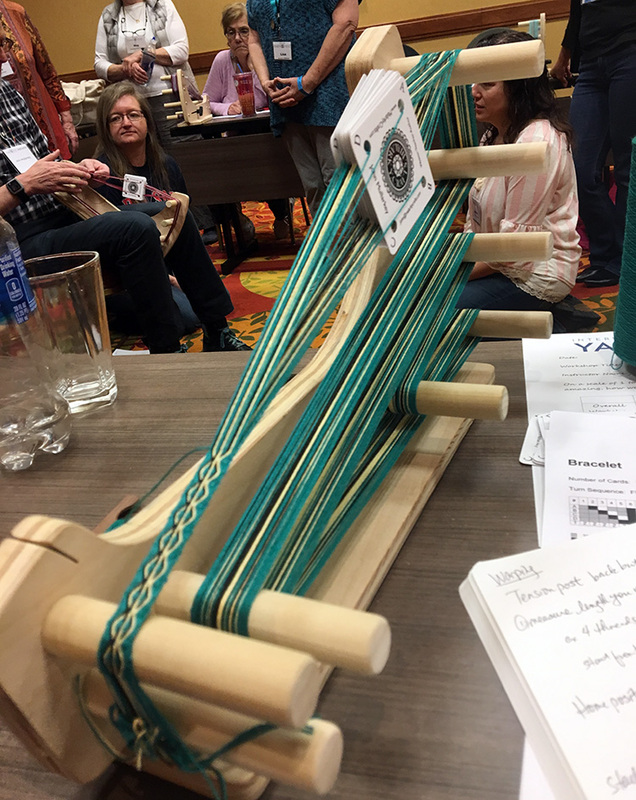 At the end of March I took a class with John Mullarkey at Interweave’s YarnFest. I’ve taught with John a few times at various conferences. In 2017 at Midwest Weaver’s Conference, his classroom was right next to mine. We were on the top floor of an old building in July in Indianapolis. The air conditioner could not keep up with how hot it was and so we had the classroom doors open. Every so often through the whole conference we’d hear uproarious laughter coming from John’s classroom. Ever since I’ve wanted to know why tablet weaving was so much fun. I bought John’s book and videos at that conference and had made a few bands on my own, but I couldn’t get the laughter out of my head. I needed some inspiration. There was one spot left in his class at YarnFest and I grabbed it. I decided I wanted to take the very beginning tablet weaving class. I hate to miss things and I wanted to get all those beginning tips you miss if you skip ahead. 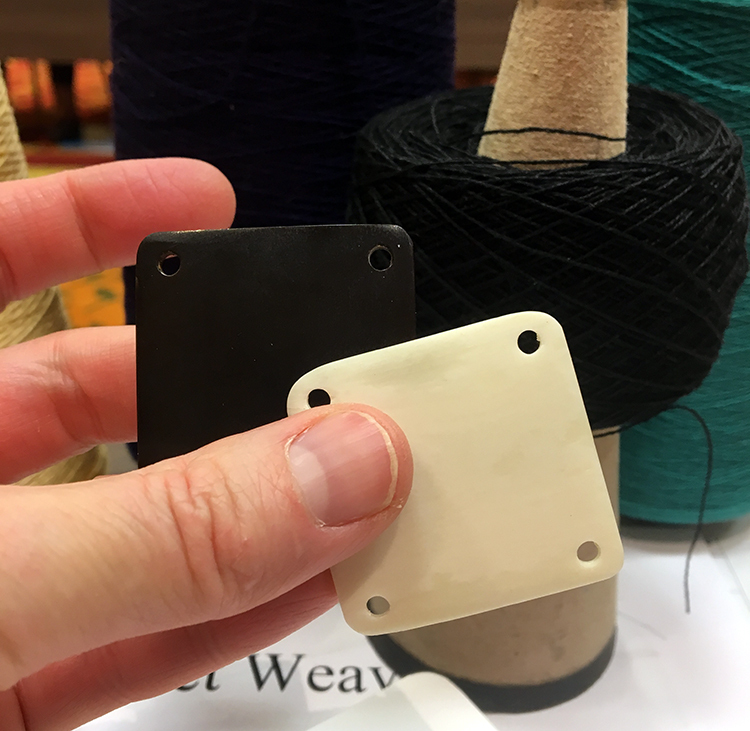 Tablet weaving, also known as card weaving, is an old technology where cards with four or more holes punched in them are used to change the pattern in a woven band. Basically you’re creating a 4-ply cord which is locked in with the weft thread. The resulting fabric is super tough as John demonstrated with the worn-out but still functional strap of a bag he’d used for years. John brought a lot of examples of different sorts of cards and tablets that have been used for this technique—everything from one he made from polymer clay to a square playing card. But his business card is the best example. If you take one of his classes, these are the cards you’ll use. John is an excellent teacher. I think he can read minds because he anticipated most of my questions before I even asked them. I loved that we had a pattern everyone was weaving. I could walk around the classroom and look at what it looked like with different colors and kinds of thread. I was using 10/2 cotton which was finer than the crochet cotton a lot of people were using. That meant my band was narrower and more flexible. 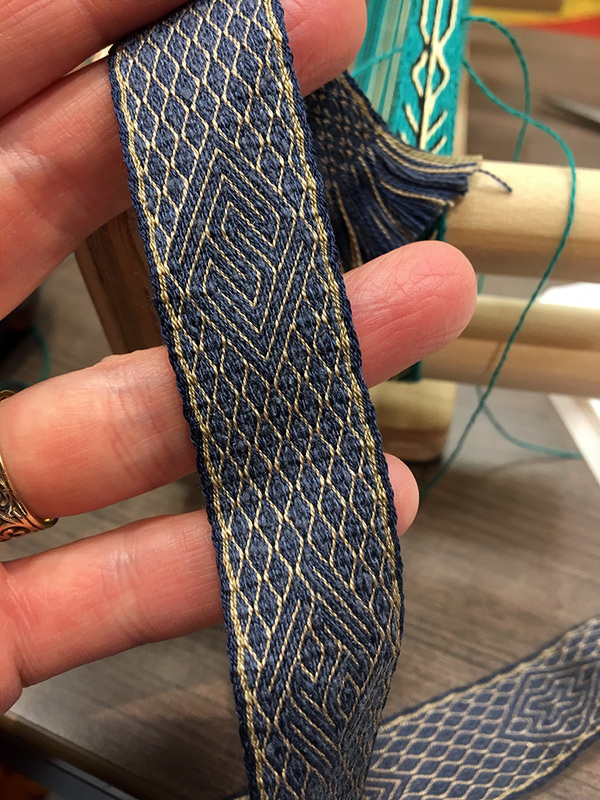 I was thrilled to be warped up before lunch and to be weaving away after lunch. I had warped the loom with a longer warp anticipating a whole afternoon of card turning and I was determined to weave that warp completely off. I’m a quick study and I don’t like to be bored. John was onto me. I did weave quite a bit of that pattern but then he started changing things up. Sure you can warp the loom one way to produce a particular pattern, but those same cards will produce many other patterns depending on how you turn them and what position they are in. So I abandoned my long one-pattern band and set off to experiment. Though I was initially attached to having a perfect finished project, once I started messing around with the patterns, I easily gave that up. It was so fun to see what would happen if I changed the turn numbers and directions or started the pattern with a different home position. As in the class I had the day before with Kate Larson, I printed out some photos from the day and pasted them into my notebook. I do this for workshops I take so that I can remember what we talked about. I’m a very visual learner and if there is a photograph associated with the words I’ve written down, I can better remember the class. This serves as a great reference later on when I am working on a project on my own and can’t quite remember how something was set up. I did not finish that warp that day. I took it off John’s loom and brought it home. I intended to put it on my inkle loom to finish weaving it but got too excited about the other patterns he’d give us. So, onward to this! I’ve been weaving on it off and on all week and have been perfectly happy just following the turning draft. I was asked rather pointedly by my spouse what I was going to do with it. I felt the question was beside the point. I’m imagining some ways to mix tablet weaving with tapestry. I think there is precedent for this in the textiles of Central and South America, so if anyone has references for me, I’d love to hear about it. I did remember I have a copy of Peter Collingwood’s Tablet Weaving book that was my grandmothers,* so I dug that out and can’t believe I’ve never opened it before. John referenced a photo in the book of tablets still attached to the weaving from the 9th century in Norway. I found the photo which is indeed impressive. The tablets were wood and the whole thing was preserved in a “ship burial.” The Collingwood book looks to be a treasure trove of information and when paired with John’s books, patterns, and videos, I think I’m set for life. These might be my next project. Who wouldn’t want card woven shoelaces? Thought I wouldn’t say that tablet weaving is simple, I would say that the loom is simple. As a tapestry weaver, the use of simple looms to make complicated and beautiful things, is appealing to me. Tablet weaving, like tapestry weaving, has been around for many thousands of years. And due to the durability of these textiles and the wonderful fun it is to weave them, I think both the textiles and weavers that make them will be around for thousands of years more. *As in all my grandmother Marian’s most loved books, there are wonderful comments throughout. This is what she wrote on the coverleaf to Collingwood’s book. My grandmother Marian’s notes in Peter Collingwood’s Tablet Weaving book. I don’t know where her “catching the whipperwill [sic]” quote comes from, but it seems like good advice all around. Enjoy spring and go weave something!